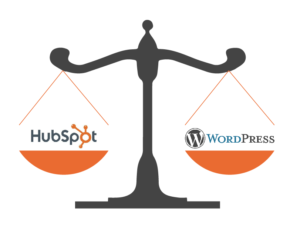 A London-based CEO with three lines of business contacted me to help his team think through choosing between HubSpot and WordPress. Different members of his team advocated for WordPress, while others advocated for HubSpot. Their primary concern was cost of ownership. The cost of moving or the initial setup would not be a big factor for their budget. This is because they had over half a million records in their email lists and they knew that the size of the list is what would drive up the price of any solution. They were currently hosting a custom website platform on RackSpace and using SugarCRM. Marketing automation, landing pages, CTA’s (calls to action) and blogging were strong drivers in their decision making. They wanted a platform to enable marketing and sales to be more independent and quicker when it comes to creating content, whether it be blog posts or landing pages for special promotions or marketing programs. Their current email marketing falls into two large categories. The final decision was made to move forward with HubSpot. They became convinced that HubSpot’s lead nurturing tools, activity in the marketing space and experience were more appropriate for their business than a customized WordPress solution. This was despite a very compelling alternative, which they put a lot of thought into. I am very pleased that we could help lead them to the solution that best meets their needs. If their needs should change in the future I have no doubt that they will call BlogWranglers again, this time to discuss migrating from HubSpot to WordPress. What are your criteria and which platform suits your needs? Let us know in the comments. This entry was posted in Blog-Move, Migration Reasons. Bookmark the permalink.